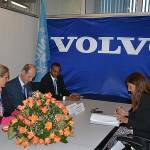 RABAT, 20 November 2014 – The United Nations Industrial Development Organization (UNIDO) is partnering with the Volvo Group, the US Agency for International Development (USAID), and the OCP Foundation, to support vocational training for mechanics in Morocco. The courses will be conducted in collaboration with local authorities and each year will help train some 150 students from Morocco, as well as from the Ivory Coast and Senegal. “Trained mechanics will have the opportunity to gain work in countries with high unemployment, while Volvo will gain access to the trained personnel that is required in order to expand in Africa. By training local manpower, we will contribute to sustainable growth in the countries in which Volvo operates,” said Niklas Gustavsson, Volvo Group Executive Vice President Corporate Sustainability and Public Affairs. “Vocational schools that correspond to the competency needs of industry are key to creating job opportunities and growth,” added Gustavsson. The trainee programmes will commence in 2015 and the operation will be conducted on the same premises as the existing national vocational school, Ecole des Métiers du Bâtiment et Travaux Publics, in the city of Settat. UNIDO Representative in Morocco, Jaime Moll de Alba, said that the establishment of the training school in Morocco was the result of cooperation with the Moroccan Ministry of Education and Vocational Training. “The new academy will equip the youth with the skills required by industry and thereby help them find a job,” said Moll de Alba. 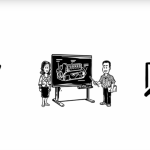 Last year, the Volvo Group announced that vocational training schools for mechanics and drivers for trucks, buses and construction equipment will be established in ten African countries. In collaboration with national education authorities, the Volvo Group will develop and finance the programmes based on the industry’s local competency requirements. 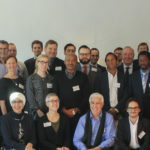 The programmes will be conducted in the countries that are strategically key in terms of business for the Volvo Group, and also for the aid strategies of SIDA and USAID. Volvo’s trainee programmes in Africa constitute a further strategic development of a pilot project implemented by the Volvo Group through Volvo Construction Equipment in collaboration with the UNIDO and SIDA in Addis Ababa in Ethiopia.